The long-awaited Brexit agreement was dealt a big blow this past Thursday when two top Brexit officials and four Jr Ministers quit — citing the deal Prime Minister Theresa May reached with the EU was no good. What does it mean for housing? The U.S. Dollar, U.S. Bonds and home loan rates benefitted from the Brexit chaos as global investors parked their money in the relative safety of U.S. Dollar denominated assets (currency and Bonds) in what is called a “safe-haven” trade. If the U.S. dollar strengthens further, the Fed may not raise rates as expected in 2019 because more hikes would further suppress inflation, which is already tame — again, good for home loan rates. 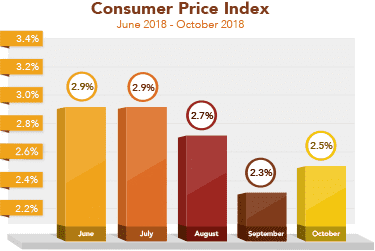 Bottom line — rates have improved from the worst levels of the year and it is quite possible that the highest rates of the year are behind us. The upcoming week is shortened due to the holiday with all U.S. markets closed on Thursday for Thanksgiving. On Friday, the Stock markets close at 1:00 p.m. ET while the Bond markets close at 2:00 p.m. ET. This week is typically an uneventful low volume trading week, but with the Brexit headlines hitting the wires, we could see a sharp move based on positive or negative headlines. Remember, home loan rates improve on uncertainty and negative news. The opposite is true. The economic reports will be crammed into Monday, Tuesday and Wednesday and include reports on housing and consumer sentiment. Housing news will come from Monday’s NAHB Housing Market Index, Tuesday’s Housing Starts and Building Permits with Existing Home Sales on Wednesday. Weekly Initial Jobless Claims and Consumer Sentiment will be released on Wednesday. Housing news will come from Monday’s NAHB Housing Market Index, Tuesday’s Housing Starts and Building Permits with Existing Home Sales on Wednesday. Weekly Initial Jobless Claims and Consumer Sentiment will be released on Wednesday.